Horsewoman Rebecca Ondov offers a cheerful equestrian-themed diary that helps girls aged 8 to 12 to connect their interest in horses with truths about God. Energetic graphics combine with helpful questions and activity ideas to stimulate reflection on God and his Word. 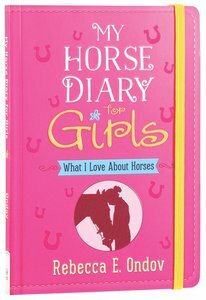 About "My Horse Diary For Girls"
Horsewoman Rebecca Ondov uses a tween's love of horses and diaries to encourage girls 8 to 12 years old to write down their thoughts, explore their dreams, and discover more about God and themselves. Energetic graphics, fun thoughts, and special horse photos decorate this cheerful diary, while helpful questions and activities guide their journaling. Horses aren't the only creatures designed to do special things. Did you know God created you with special talents? What do you like to do? Have you thought of God as having a huge imagination? Look at all the different horses He created. Why not draw or cut out pictures of different breeds of horses and paste them below? Tween girls will enjoy reading and writing in this diary, and they'll discover important biblical truths to help them grow spiritually.